Chris Williamson, Chief Economist at Markit offered this interpretation: "The eurozone is showing clear signs of healing, with the downturn easing sharply in January and the region moving closer to stabilisation in the first quarter. ...."
I disagree with Williamson. Those divergences show the eurozone is getting sicker, not healing. If there was any healing, and certainly if there was any rebalancing, manufacturing and export growth would be picking up in Spain, in Italy, and in France at the expense of Germany. 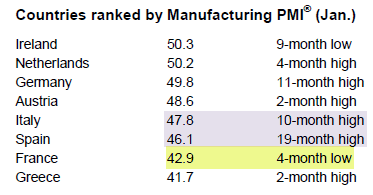 A quick check of the Markit Eurozone Manufacturing PMI will show that is not what's happening. There are certainly a lot of highs. However, Italy and Spain are still in deep contraction and France is a certified zombie. How much of the recent growth in Germany and the Northern European countries (and a decline in contraction in Italy) is simply a result of shifts due to the unsound economic policies of French president Francois Hollande rather than "stabilization" per se in Germany and elsewhere? Regardless of "why", it's not "stabilization" that's needed, but rather rebalancing, and on that score things are headed in the opposite direction, with France leading the way. The implosion in France was easy to see and I called for it well in advance. June 08, 2012: Hollande About to Wreck France With Economically Insane Proposal: "Make Layoffs So Expensive For Companies That It's Not Worth It". The results are as expected. Companies that cannot fire workers will not hire them in the first place. As expected, at least in this corner, the French economy has started to implode. Service sector business activity is dropping at fastest rate since October 2011. More importantly, the Markit Composite PMI sports the steepest rate of contraction since March 2009 with job losses accelerating at the fastest pace in 33 months and output plunging at the fastest rate in 42 months. Economic insanity in France continues at a steady pace. The latest bit of insanity is Hollande's Threat to Nationalize Steel-Maker Mittal. There is no real stabilization and there is no healing. Rather, the policies of Hollande are so disastrous that some output has shifted to Germany and elsewhere, (coupled perhaps with some inventory replenishment and a temporary stimulus-fueled increase in demand in Asia). Even that cannot last. How can it? US growth has stalled (at best) and 2% payroll tax cuts will tip the US into recession (assuming it's not there already). With employment sinking in France, Italy, and Spain, precisely who will buy German exports? Properly rebalancing will require a shift in production from Germany to the rest of Europe as well as a shift towards more consumption in Germany from the rest of Europe. That cannot and will not happen with the destructive polices of Hollande, and the lack of reforms in Spain and Italy. Moreover, and as I have noted on many occasions, the entire Euro construct is flawed. Until those flaws are fixed, there is only the illusion of stabilization, and that based on more unbalanced growth. The only thing that has stabilized (for now) is interest rates, and even that won't last. It will be of no net benefit if Spain heals but France goes down the gutter. Indeed, it would be a net loss as France is the eurozone's second largest economy, with Spain a distant fourth. But is Spain about to heal? The PMI shows a slowing rate of contraction. However, the contraction is still steep and Spain is nowhere near meeting its budget deficit targets. Any positive divergence is Spain (mostly imaginary) must be viewed in light of missed budget targets, rising unemployment, and falling tax collections smack in the face of higher tax rates. So don't expect much more from Spain, even as France worsens. Something has to give. And it's something very few people see coming. One way or another Germany will pay a huge price. Until one of those things happens, signs of stabilization are nothing but an illusion. The Eurozone is a failed experiment. Structural flaws were too great initially, and they have increased over the years. No currency union in history has ever survived unless there was also a fiscal union. Current politics says it cannot happen, on meaningful terms. A breakup is inevitable, just as it has been from the beginning. The key is to manage a breakup in the least destructive manner. Option 1: If Germany (and the northern states) left the eurozone, the Deutschmark (and respective currencies) would immediately be credible. The downside to Germany (and the northern states) is debts to German banks would not be paid back in Deutschmarks but rather deflated (but not worthless) Euros. Option 2: The second option is a piecemeal, destructive breakup. Should Greece and Spain leave first, those countries might experience a complete loss of faith in currency resulting in hyperinflation. The Northern states would be paid back in worthless notes, if they were paid back at all. Note that Germany and the Northern creditor nations suffer regardless. Either they keep ponying up bailout money, there is a managed breakup, or a piecemeal destructive breakup. It would be best for all involved if Germany left the eurozone and went back to the Deutschmark. There are no other options, and no other choices. Meanwhile, imbalances grow and German taxpayers keep funneling tax dollars to the Southern states to keep them afloat. How long German citizens are willing to put up with this sorry state of affairs (in addition to the shenanigans of the Mario Draghi ECB) remains to be seen.